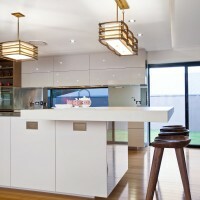 Australian interior designer Darren James has sent us one of his recently completed kitchens. The best of East meets West, this design demonstrates the successful combination of minimalist principles seen in traditional Japanese design with the contemporary Australian lifestyle of a typical modern Australian family. The result is simple clean lines paired with warm earthy tones; rich wood finishes married to organic elements and cabinetry artfully arranged to create a balanced, harmoniousand functional kitchen highly sought after by the client. Re-building a house brings many benefits including the opportunity to plan a kitchen to meet every requirement. Presented with a large blank canvas the owners requested that I design a kitchen that “made a statement about who they are”. For this young family of four this meant creating a simplicitic, relaxing and functional kitchen environment that paid respect to their Japanese heritage and echoed their love for contemporary Japanese design. At the heart of Japanese design are the principles of minimalism, simplicity, space and order. Beauty lies in how simple and functional each design element is and how harmonious the overall effect. 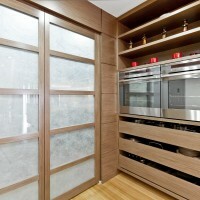 Incorporating these principles into the kitchen design required an exercise in control and attention to detail. The Japanese concept of “ma”, a conscious feeling of space, plays an important role in this design ensuring freedom of movement and imparting a sense of calm and ambience in the room. 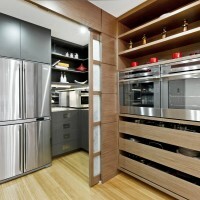 The choice of an open-plan galley style kitchen ensures the space is not overloaded. Set-in kicks and an 80mm cantilevered feature stone island bench allow the cabinetry objects to “breath”; and rather than being regarded as ‘empty’ or ‘unused’ as it would perhaps in western design – the space that surrounds these objects creates a “push-pull” effect between empty and occupied and creates visual interest. Sensitive towards the need for non physical boundaries and with the desire to create a modern twist on the traditional tatami wall a small drop down ceiling incasing LED strip lighting subtly and seamlessly defines the space. Simplicity and minimalism features in both form and function in this kitchen and the result in a functional yet restrained design. 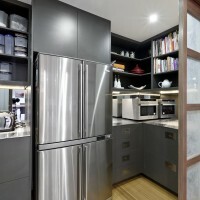 At the rear of the kitchen a butler’s pantry focused purely on function ensures the kitchen is kept clutter free and houses the refrigerator, stores food and bulky everyday appliances whilst also acting as an out of the way prep zone when entertaining. Sliding shoji doors constructed with timber veneer and rice paper glass are typical of traditional Japanese style and provide the perfect divider and between the two rooms. 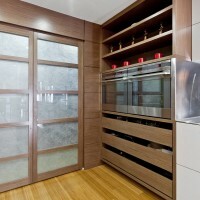 Clean lined cabinetry consists of flush lines, recessed handles and thin benchtops. A calming Zen like feel is accomplished through the use of natural materials and subdued colours. Natural elements such as the bamboo flooring (typical in most contemporary Japanese design), textured veneer and stone give the space an earthy and organic feel. But minimalism is not only seen in the esthetics in this kitchen design. Practicality and functionality is equally important and no individual item has been selected solely for its aesthetic or decorative value. For example the selection of two side by side Electrolux ovens offers the ability to entertain multiple guests (as requested by the client) whilst also creating a sense of balance in the veneer feature. 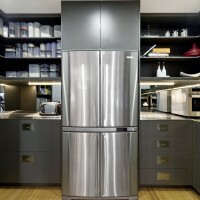 The same applies to the placement of the refrigerator which are strategically placed in the centre of the room ensuring both easy access and balance within the space. Furthermore, each individual surface has been selected for both functional as well as textural and tonal value. Stainless steel for its hardwearing hygienic surface is the perfect material for a home chef that enjoys entertaining; Staron’s durability and stain resistance properties as well as its ability to be resurfaced makes a smart choice for an ‘everyday’ kitchen centre piece; and the undulated surface of the cantilevered bench top and it’s form within the kitchen space contrasts with the smooth surface of the Staron and stainless steel and ensures the casual dining area is defined. Even accessories such as the solid timber stools with their organic shaped seats reflect the minimalistic style encapsulated in this Japanese inspired kitchen. 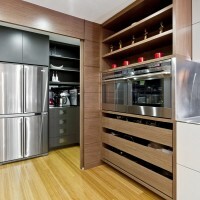 Ensuring colours do not stand out from the architecture of the cabinetry provides a sense of geometric order. The soothing neutral palette of brown, creams and grays minimizes the feeling of clutter, which is also essential to eastern design and its philosophy of simplicity. Whilst the tonal values are not contrasting, the statement and perhaps the flagship of this kitchen is in the strong exclamation of predominate texture. In keeping with the yin and yang of Japanese culture the kitchen design seeks balance in opposing and contrasting elements. 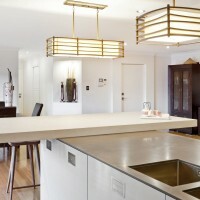 Rough plays off smooth and the texture of the veneer joinery and the ‘Jaipur undulated’ finish of the cantilevered island bench gives the gloss lacquered cabinetry, Staron and stainless steel benchtops an even smoother appearance. Besides creating a strong textural element the horizontal express joins seen in the veneer cladding and horizontal bars in the feature lights (often seen in Japanese furniture) represent man’s relation to the earth. Like all Japanese interior design, lighting is given proper importance. Available natural light is accessed through the narrow slot window which also visually extends the space to the outdoors where the owners are able to keep an eye on their young children playing in the back yard. In Japanese interiors lighting is not only a functional but an integral part of the interior. Here, particular attention is paid to the Japanese style of diffused light. 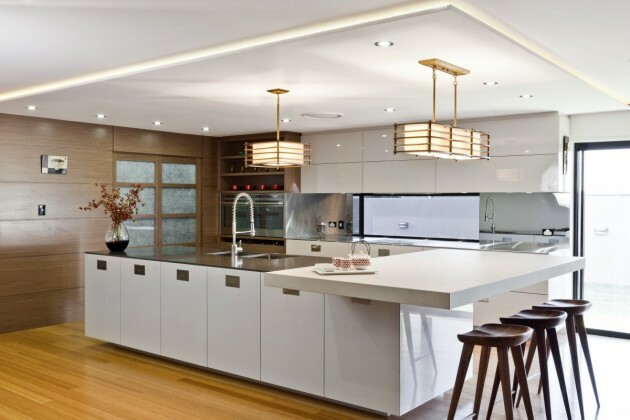 In addition to the concealed LED lights in the surrounding bulkhead, Japanese style custom made pendant lights hang above the island bench. The rectangular linen shades and white etched glass diffuser combined with the geometrical timber squares resemble that of a shoji screen and ensure the light is unobtrusive and gentle creating a relaxed calming atmosphere. Visit Darren James’ website – here.